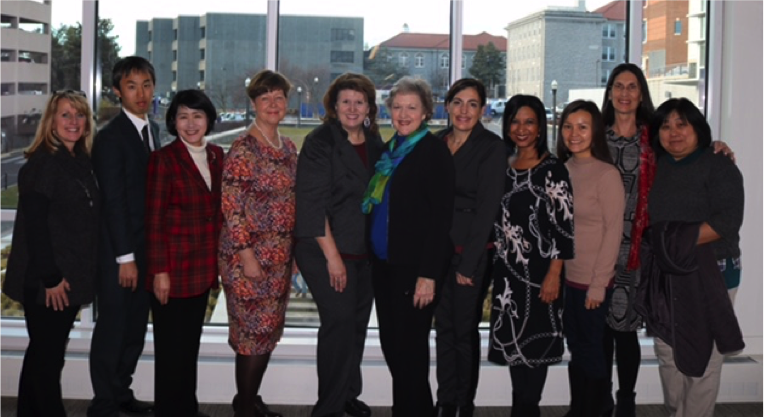 The members of the INU Nursing Leadership Collaborative, comprised of leaders in nursing education from INU member institutions, gathered at James Madison University, January 22-26, 2017. This event, supported by the 2016 INU Seed Money Fund and JMU’s School of Nursing and Center for Global Engagement, focused on planning the 2017 INU Nursing Workshop to be held at Hiroshima University, Japan, August 4-12, 2017. The program is scheduled to take place concurrent with the Peace Memorial Ceremony on August 6, 2017. Focusing on the theme “Global Perspectives on Quality and Safety: Improving Patient Outcomes,” the workshop will include expert speakers from INU member institutions, visits to health care delivery settings, and interactive learning experiences. At the core of the workshop are Quality and Safety Education for Nurses (QSEN) competencies. The workshop aims to engage participants in active learning through examining national perspectives that drive quality and safety in order to develop a global mindset for delivering quality safe care. The organizers are planning healthcare facility site visits where participants will be able to identify safety risks and propose solutions that improve quality care. Competency in providing safe quality care with an increasingly global population within nations and across the world is imperative for the nursing profession. Dr. Gwen Sherwood, a global expert on QSEN and safe quality care, has been consulting with the INU Nursing Leadership Collaborative and will continue to participate in the program planning, curriculum development and implementation, and learning outcomes assessment. The 2017 INU Workshop on Global Health and Nursing is a program designed for highly motivated undergraduate and graduate nursing students who are interested in 1) increasing their understanding of global perspectives on safe quality care, and 2) engaging in active learning in a demanding academic and cross-cultural environment. Applications for the program will be available in early March 2017.